Hail to the king — the Lion King. Walt Disney Studios has finally unleashed the first teaser trailer for its upcoming adaptation of The Lion King, the Jon Favreau-directed, live-action take on the adored 1994 animated classic. The House of Mouse decided to drop the footage when millions of eyes across the U.S. were glued to television screens — on Thursday, November 22 during the Thanksgiving football match between the Dallas Cowboys and the Washington Redskins. The teaser, which comes in at just over a minute and a half in length, recreates the famous opening sequence from the original Lion King. We see gorgeous shots of the sun rising over the African wilderness, a pack of Thomson's gazelles lifting their heads from the ground and turning to face the sun, and a flock of birds flying over a shimmering marsh before a familiar voice booms in the background. "Everything the light touches is our kingdom," says King Mufasa, voiced by James Earl Jones, who reprises his role from the '90s film. He continues, telling his young son Simba, voiced by Donald Glover, that his time as king and his life on Earth will someday come to an end — and Simba will have to rise up and lead a new generation in his stead. "A king's time as ruler rises and falls like the sun," he opines as the camera pans to show Simba's tiny lion paw stepping into a print his father left behind, and then shifts to tease the scene in which Mufasa faces his tragic, untimely demise (one that seriously traumatized us as children). "One day, the sun will set on my time here. And will rise with you as the new king." Then comes what's arguably the best part of the teaser and undoubtedly the most frequently quoted part of The Lion King as a whole: the unforgettable Zulu chant that starts the original film's opening song, "The Circle of Life." As the powerful lyrics "Nants ingonyama bagithi Baba / Sithi uhm ingonyama" sound out, the teaser shows the eccentric yet wise baboon Rafiki (voiced by John Kani) swiping pollen across the newborn Simba's forehead, then walking to the edge of Pride Rock and lifting him – the son of King Mufasa and Queen Sarabi (voiced by Alfre Woodard) — in the air to present him to the animals of the Pride Lands. The footage then closes on an older Simba roaring at the sky as Mufasa says in voiceover, "Remember." 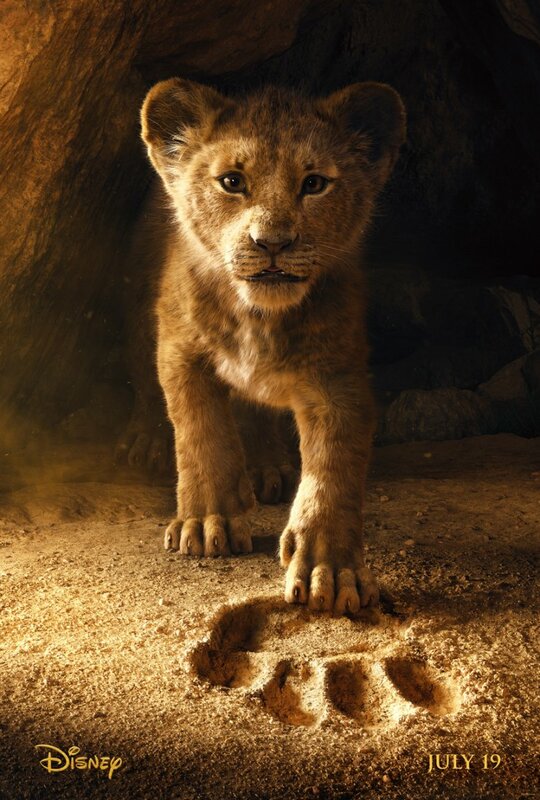 Watch the full teaser in the video above, then take a gander at the first poster for The Lion King at the bottom of this article. The new Lion King is just one of a number of massive movies Disney will debut in 2019. March will see the Mouse House launch Captain Marvel on the 8th and another live-action remake, Tim Burton's Dumbo, on the 29th. May marks a double dose of film fun that unfurls in the same pattern: Disney will roll out the next Marvel Cinematic Universe entry Avengers 4 on the 3rd of that month, followed by the live-action Aladdin on the 24th. On June 21, fans can see Toy Story 4, and a few weeks later, it will be time for The Lion King to shine when it opens wide on July 19. After that, Disney has Artemis Fowl lined up for an August 9 debut, Frozen 2 set for November 22, and the hotly anticipated Star Wars: Episode IX ready to go on December 20. It's clear that Disney isn't slowing down (really, when has the company ever pumped the brakes? ), and is bound and determined to make 2019 its biggest year at the movies to date. The Lion King will certainly help make that goal a reality. Also featuring the voices of Beyoncé Knowles-Carter as Nala, Chiwetel Ejiofor as Scar, John Oliver as Zazu, Florence Kasumba as Shenzi, Eric Andre as Azizi, Seth Rogen as Pumbaa, and Billy Eichner as Timon, The Lion King will begin its theatrical reign on July 19, 2019.